Apple is expected to join the lucrative home entertainment market, estimated to be worth $31.8 billion in the U.S. alone, in the next two to four years by offering a $2,000 Internet- and content-connected HDTV. In a note to investors issued Tuesday afternoon, analyst Gene Munster with Piper Jaffray said the move makes strategic sense for Apple, as the Cupertino, Calif., company has a history of success in redefining mature markets. "As connected TVs gain traction, software, content and portability will become the key differentiators and Apple is uniquely positioned to deliver a premium all-in-one solution (different than Apple TV)," Munster wrote. The analyst said he believes Apple will combine hardware, software and content in one product with a competitively priced $2,000 HDTV. When combined with a potential iTunes TV subscription plan priced between $50 and $90 per month, users would no longer have a need for their monthly cable bill. Munster said Apple's established brand with iTunes and its 125 million accounts overlap into the U.S. HDTV market, which is projected to move 32.4 million units in 2010. He said an Apple-branded HDTV would "move the needle" for the market, with the hardware maker delivering a product that would serve as the replacement for an entire entertainment center, beyond just the display. In addition, the established iPhone and iPod touch brands, along with the forthcoming iPad, could bring portability to the TV industry, allowing users to take their content with them and watch it anywhere. He said Apple's established brands puts the company in a "unique position," allowing it to be on the forefront of a coming line of HDTVs that will be constantly connected. In his analysis, Munster said although HDTV shipments are up 268 percent in the last five years, average selling prices for the devices have dropped by 50 percent, and the market's revenue is expected to contract in 2010. He believes if Apple introduced a device that would negate the need for a Blu-ray player, digital video recorder, cable box and game console, the company's $2,000 HDTV could represent a significant change for the market. He noted that Apple has a great deal of experience with high-definition displays on its iMac desktop. Late last year, Apple introduced a new, big-screen, 27-inch iMac desktop. 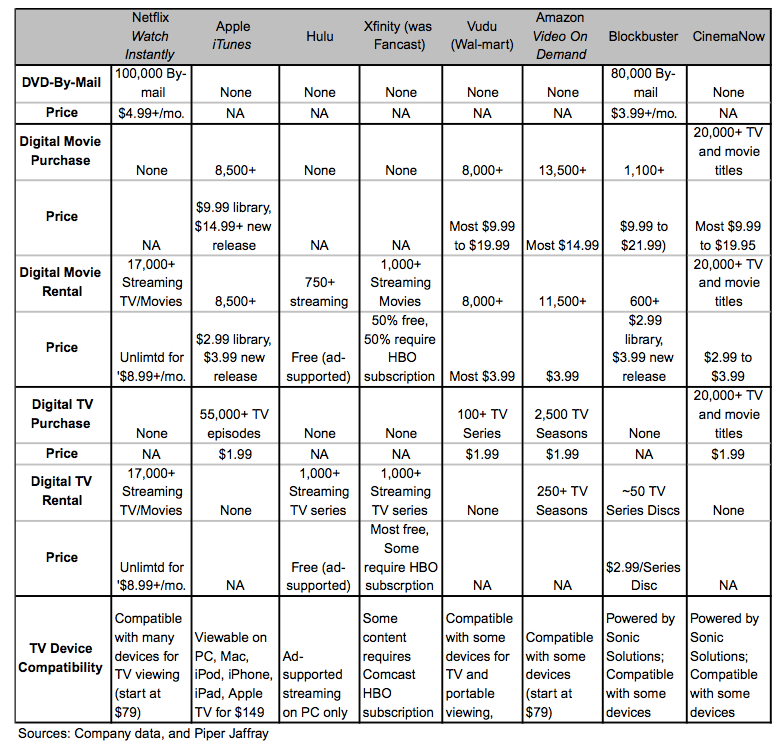 The need for a cable box and DVR could be replaced with an iTunes TV pass priced between $50 and $90 per month. And without separate components, consumers would no longer need to pay a professional installation fee. Another important component of the living room experience is games, a business segment that Apple has found great success in, with the iPhone and iPod touch. With a connected TV with access to the existing App Store, Munster believes Apple could enter the market quite easily. "Given Apple's recent success in portable gaming," the analyst wrote, "an all-in-one TV could be a logical next-step for the company to expand its reach further into the gaming market with limited risk using an existing technology infrastructure." Even though the TV hardware market is currently a "challenging, low-margin business," the analyst said he believes Apple could "change the rules of the game" by offering best-in-class hardware, software and content at a premium price. "If history repeats itself, Apple would find a way to compete in a commoditized market with a premium priced product," Munster said. "An Apple Television would address more than just the HDTV market, as it would likely include audio and video features that could replace the TV itself." 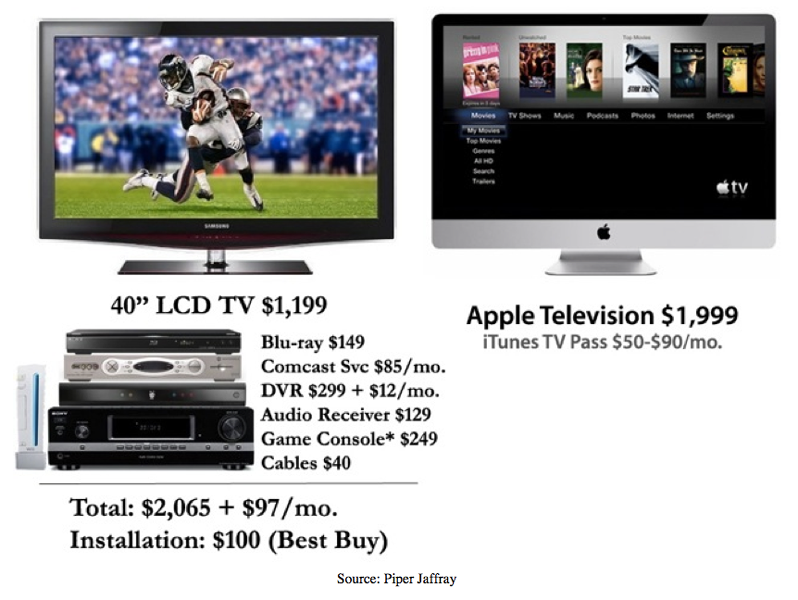 Rumors of an HDTV from Apple are nothing new, and Munster and Piper Jaffray have long been proponents of Apple entering the TV and set-top-box business. Last September, Apple Chief Financial Officer Peter Oppenheimer cooled speculation that the company might introduce its own set top box with integration with cable providers. The Apple executive said a new box, or functionality added to the existing Apple TV product line, just doesn't fit the company's business model. A major factor in Munster's forecast calls for Apple to offer a subscription TV plan that would compete with cable operators. Apple is believed to have recently pushed the concept to networks, and while some showed interest, it is believed the company has since tabled that plan and instead pushed for 99 cent TV episodes.